Do you like The Waitress? Share it with your friends. 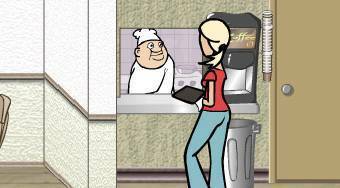 In the game "The Waitress", you can see for yourself that the job of a waitress is really difficult. Your task will be to serve as most guests in your restaurant as possible. As soon as 3 guests are unsatisfied and leave the restaurant, your career is over. Your boss is merciless, so take this advice seriously.